My diabetes educator, Gwen, was a fantastic support system for me in the initial months following my diagnosis. She was a very direct person, and had one of those strong voices that still rings clearly in my head today (even though I have not seen her in several months). She reminds me of one of those teachers who would challenge you by answering a question with another question and often leaving me stumped for a response. And although I absolutely hated it at the time, I know that she was only trying to help me to think for myself and solve the problem on my own. As Gwen would put it, her job was to teach me to think like a pancreas and make her role as my diabetes educator defunct. Gwen was extremely understanding and never passed judgement. Although she was not a diabetic herself, she was very experienced in dealing with young adults like myself and often referred to her experiences being a pretend diabetic. She was extremely supportive and was even prepared to come to my defence after I walked out of a less-than-supportive endocrinologist appointment on the verge of tears (which you can read more about here). She always made time for me if I needed it – I can even remember her once squeezing me in for a quick chat during her lunch break! Over the course of a few months, we covered all the basics like the role of insulin, hypos, hypers, sick days, travel, exercise, carb counting and making lots of adjustments to my insulin doses. If there was something that I wanted to help me manage my diabetes, Gwen would get it for me. Like an insulin pen that could dial half units. 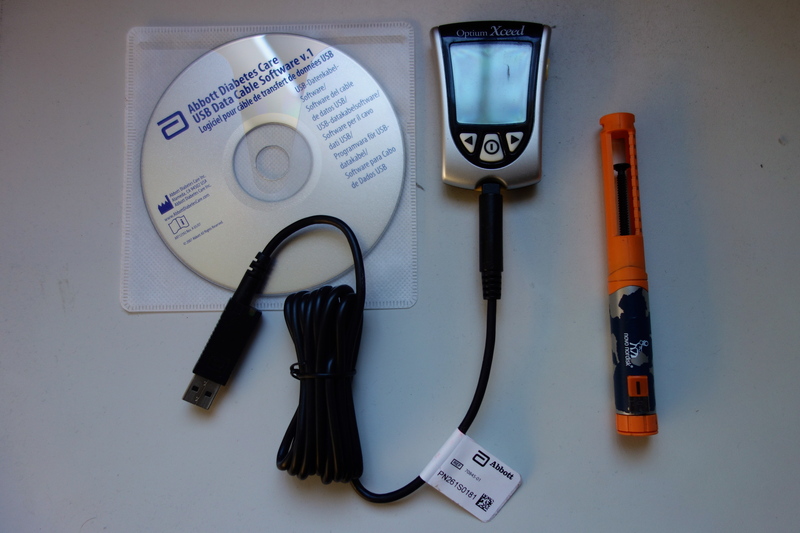 Software so that I could download my blood glucose results onto the computer. Books to record my blood glucose readings. And anything else she thought I might find useful. Within a couple of months, Gwen felt confident that I didn’t need her anymore. I did have a couple of bumps throughout that journey, but that probably belongs in another post. Its worth noting that at the age of 17, learning to manage my diabetes was much easier than if I was younger. I used to see young children in there with their school uniforms, parents and other siblings. I really do count myself lucky. One piece of advice from Gwen that I really wish I didn’t ignore was finding and connecting with other people with diabetes. I really do wish I’d found the support of the Diabetes Online Community sooner. Hell, there should be a mandatory session dedicated to the DOC! I’m forever grateful for our amazing public healthcare system here in Oz. Through that hospital outpatient clinic, I have had access to any sort of service I need to manage my diabetes – podiatry, optometrist, dermatologist, dietician – and I still do, to this very day! If only some of the waiting lists weren’t so long… As Gwen would say, getting through all of those d-related appointments in my first year would be the hardest. And it would have been much harder if I was lumped with the financial burden of all those appointments too. I’m also forever grateful to Gwen. I fondly remember her comfort and support after that nasty endocrinologist appointment. I can remember Mum wanting to buy her a small gift on my first Christmas with diabetes just to thank her for all her support during that first year. Support that I can still remember and still appreciate to this very day. Thanks, Gwen. I am so loving every one of your posts. Sorry i cant reply to each one but just want you to know I’m a BIG fan! Thanks so much Rachel, I really appreciate that you read them and you can connect with them. I really enjoy writing them as a way to reflect or just clear my head. Think we have the same Gwen mate, she has always been great and tells it to you straight. Can you imagine how hard it would be without a diabetes educator who understands you? Great post!